Find a madwoman's legendary bow. Travel to Stony Creek Cave. Once you've installed the Ruin's Edge Creation, you will receive this quest and be directed to Stony Creek Cave to recover Ruin's Edge, a fabled bow. 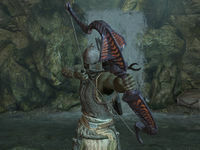 The cave's bandit boss is in possession of the bow. Defeat the bandit and claim it as your own to finish the quest. You'll also find many types of cheese on the bandit: an eidar cheese wedge, eidar cheese wheel, sliced eidar cheese, goat cheese wedge, goat cheese wheel, and sliced goat cheese. Ruin's Edge originally appeared in Shivering Isles. It was an enchanted Dark Seducer bow given to you as a quest reward by Lady Syl, Duchess of Dementia. The leveled list that adds cheese to the bandit boss is called ccBGSSSE004_LItemCheeseForEveryone, referring to one of Sheogorath's favorite lines. 100 I found a map to the location of the fabled bow, Ruin's Edge. 1000 Finishes quest I've found Ruin's Edge. On the PC, it is possible to use the console to advance through the quest by entering setstage ccBGSSSE004_Quest stage, where stage is the number of the stage you wish to complete. It is not possible to un-complete (i.e. go back) quest stages, but it is possible to clear all stages of the quest using resetquest ccBGSSSE004_Quest. This page was last modified on 29 January 2019, at 05:19.